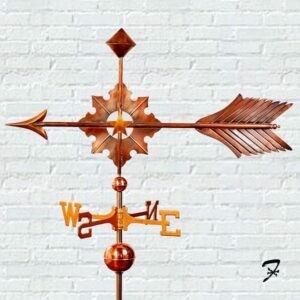 Categories: Arrow Weathervanes - Grand, Personalized Weathervanes. 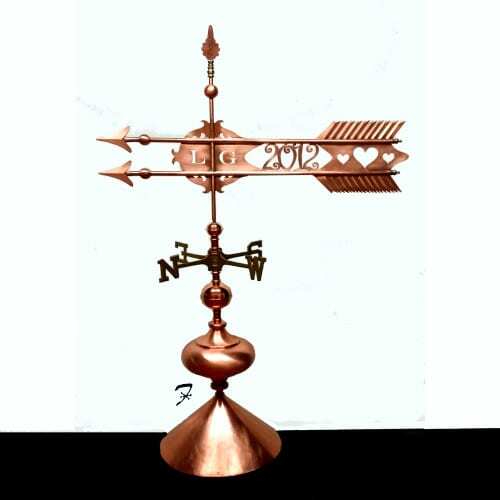 Tags: Arrow Weathervane, Copper, Personalized. Hand Crafted Copper Arrow complete with ornamental balls, brass directionals, and stainless steel post. 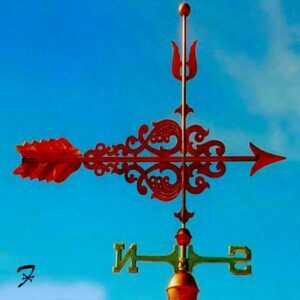 27″L x 19″H Arrow + 14″H Assembly = 33″H weathervane + 14″H mounting root. 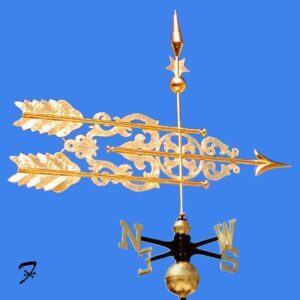 36″L x 26″H Arrow + 18″H Assembly = 44″H weathervane + 18″H mounting root. 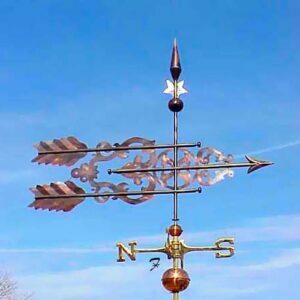 45″L x 33″H Arrow + 24″H Assembly = 57″H weathervane + 24″H mounting root. 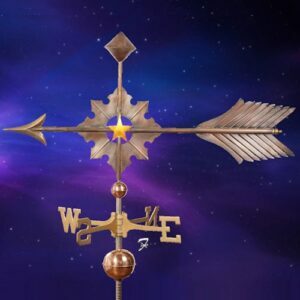 Arrow & Banner Weathervanes are among the oldest weathervane types. These designs are so timeless in their beauty, they remain popular today. They trace their roots to Medieval England. Brave knights returning victoriously from war were honored by the king. They would erect a metal banner on the highest peak on their castle. It would feature the knights family crest. Some of these proud heraldic designs still wave in the wind today over castles in Europe. 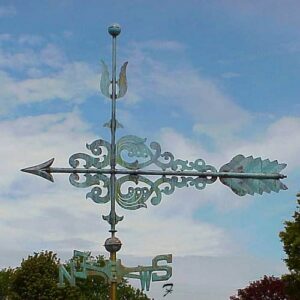 The designs on this page are tributes to the great weathervane makers of the late nineteenth century. 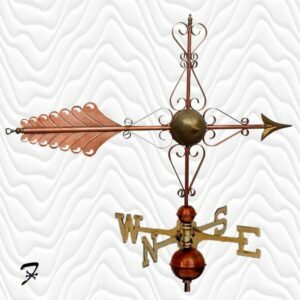 Choose from one of these individually hand crafted copper weathervanes or have a custom one created for you. 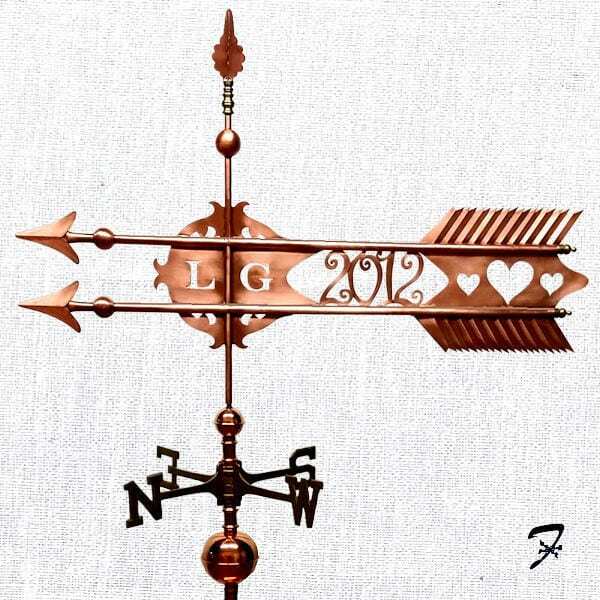 Each hand crafted weathervane comes with your choice of finish and is signed and dated by the artist.